This topic was published by DevynCJohnson and viewed 1174 times since " November 15, 2015 @ 12:53UTC ". The last page revision was " November 20, 2015 @ 11:11EDT ". Have you ever wanted to explore the Universe. 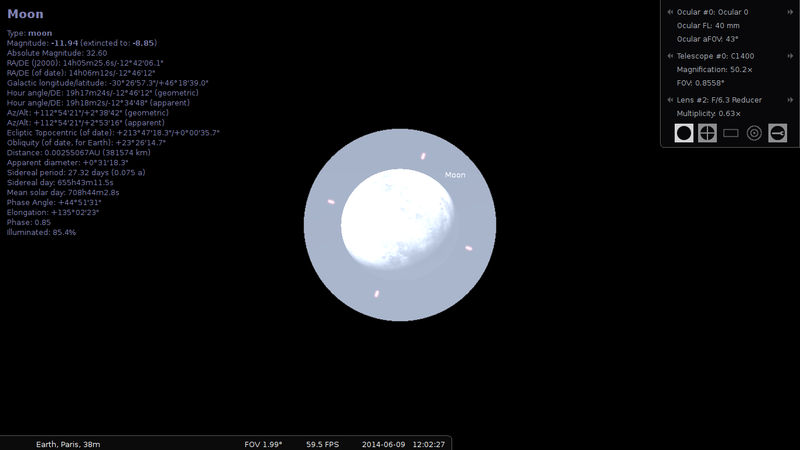 Well, with Linux, you can install many kinds of astronomy simulators and look at the universe from your Linux system. 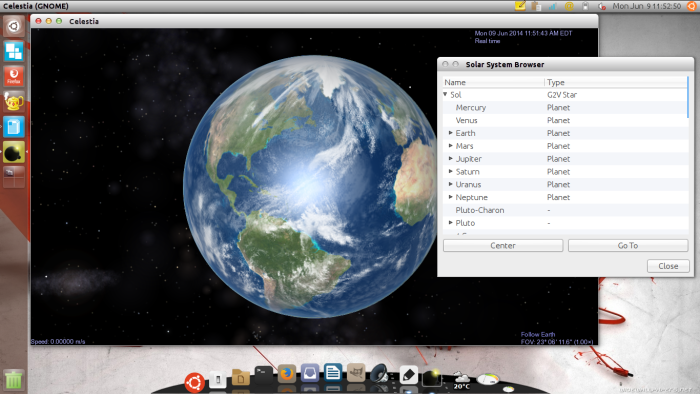 After reading this article, you will be able to have the universe in your Linux system. Xplanets is an application that allows users to experiment with the dynamics of a solar system. For example, users can create a circle representing a planetary body. This program only simulate physics. The planets and their moons have no properties themselves besides motion, size, and mass. Stellarium is a star-gazing simulator where the user is in some country land to gaze at the sky. 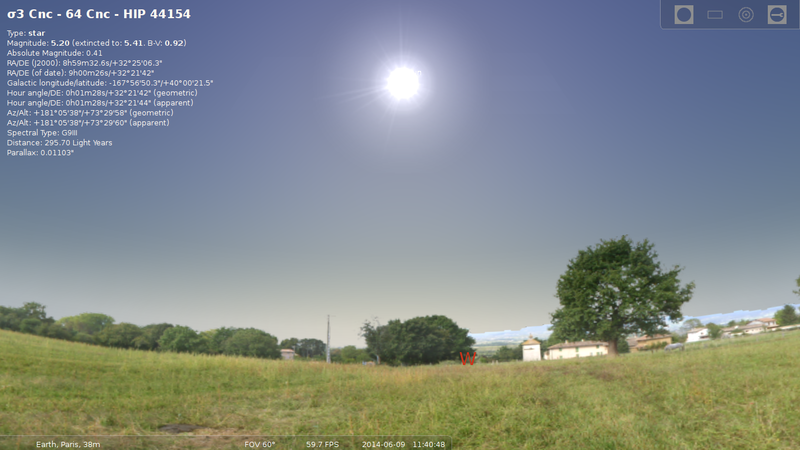 Users can simulate various binoculars and telescopes. Users can also set the time, time elapse rate, visible objects, and toggle labels. 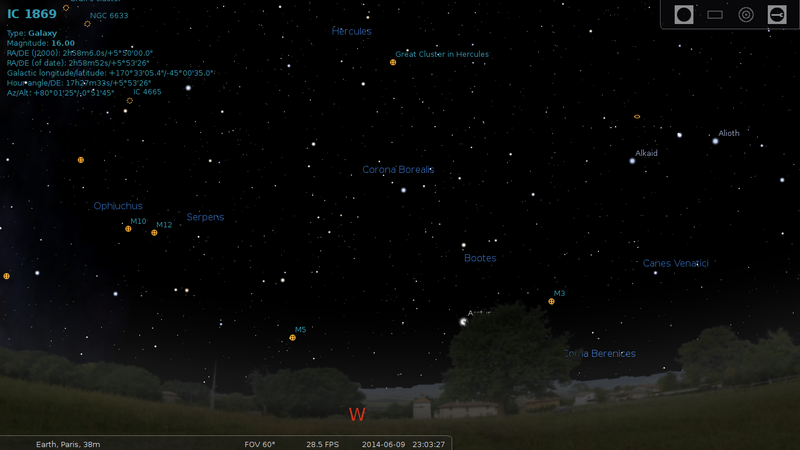 Stellarium is primarily used for educational purposes. Stellarium is compatible with planetarium projectors. For those of you that use mobile devices, you can get Stellarium Mobile for Android, iOS, and other mobile operating systems. The homepage is http://www.stellarium.org/. Here, users can get plugins and information about Stellarium. KDE users may enjoy KStars (http://edu.kde.org/kstars/) which is a star-gazing application like Stellarium. Kstars does control telescopes directly (if the hardware is supported). The webpage https://edu.kde.org/kstars/indi/telescopes/ includes details, lists supported drivers, and states that USB is supported. Celestia is a detailed 3D-simulator. 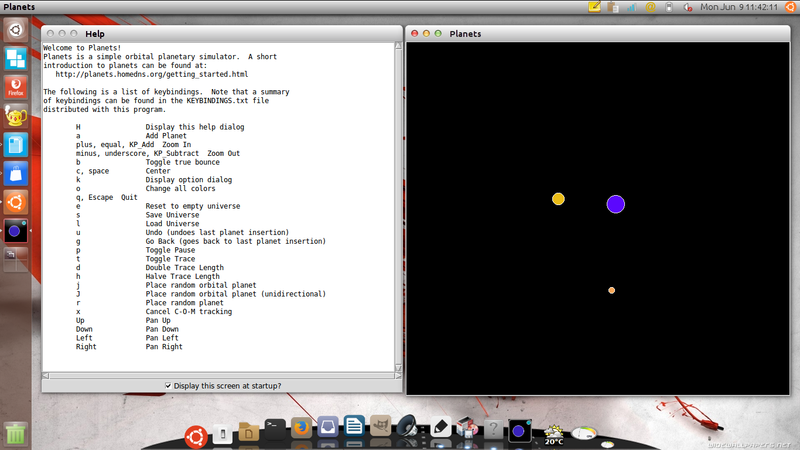 Users can explore the universe including other solar systems. Users can travel to various astronomical objects by pressing buttons to move or by looking through the object browser. The graphics are detailed and the application is not resource intensive as one might expect. Common uses for Celestia include educational teaching material and general hobbyists. Celestia's homepage is http://www.shatters.net/celestia/. People may get addons at http://www.celestiamotherlode.net/. Celestia cannot control telescopes (https://en.wikibooks.org/wiki/Celestia/Why_Celestia). However, Celestia supports scripting (https://en.wikibooks.org/wiki/Celestia#Scripting && https://en.wikibooks.org/wiki/Celestia/Command_Line), so a programmer could make a "telescope-controller" addon. OpenUniverse (http://www.openuniverse.org/) is a lot like Celestia. They both have a similar interface and set of features. 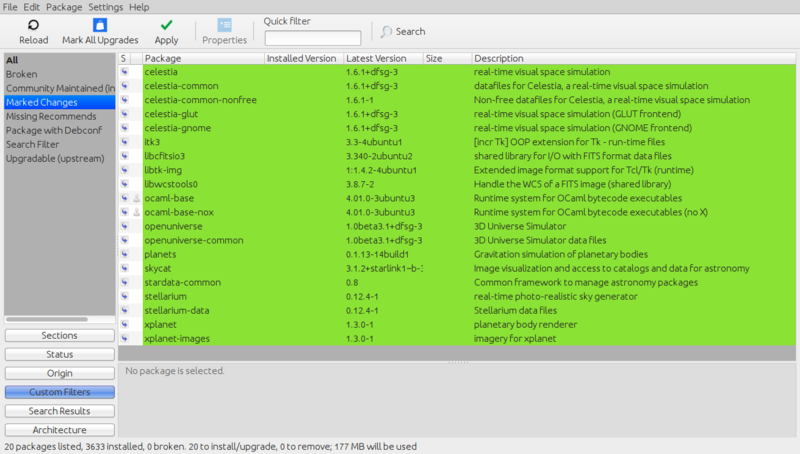 Some users may prefer Celestia or OpenUniverse. Overall, it is best to try each one to see which one you like. 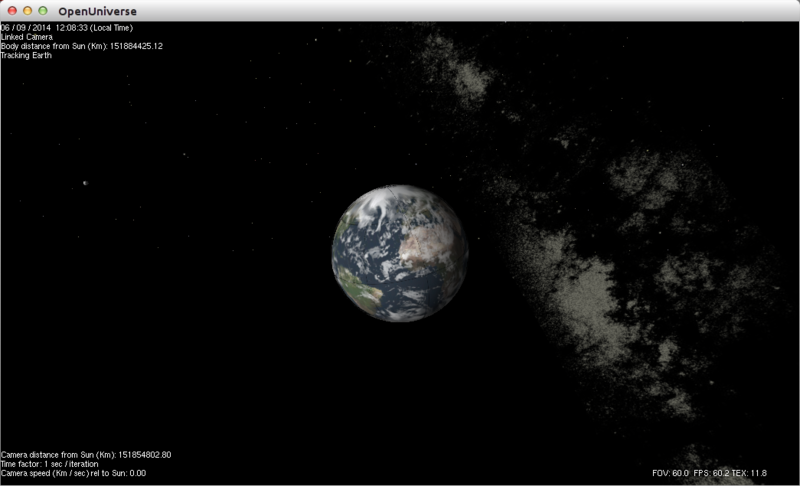 Digital Universe (http://www.amnh.org/our-research/hayden-planetarium/digital-universe/) is another planetarium open-source software that some users may like better than Celestia and OpenUniverse. 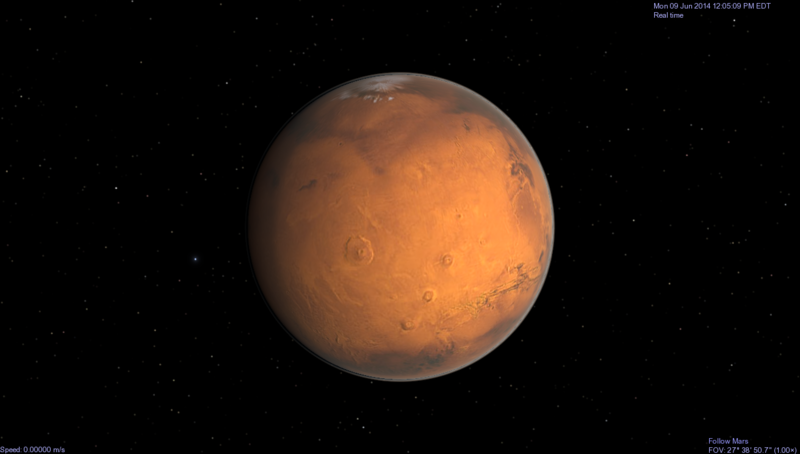 XEphem (http://www.clearskyinstitute.com/xephem/) is another piece of planetarium software for Linux. However, this program is proprietary. For those of you who like the Internet and fiction, here is a public universe simulator (http://www.galaxiki.org/). Users can make and experiment with a fictional universe that is accessible to the public. Yes, the server only offers a single universe that is shared with the whole public. This community game can help people understand astronomy by making and manipulating the virtual universe. Or, users can use it to meet new people. Starmaps can be created with software called PP3 (http://pp3.sourceforge.net/). The starmaps are saved as a PDF, Postscript, or LaTeX file. Users can also learn the surface of the moon with "Virtual Moon Atlas". The homepage is http://ap-i.net/avl/en/start. Deep sky objects can be studied with software called "Where is M13?". This software can be found at http://www.thinkastronomy.com/M13/index.html. For those of you that are deeply interested in astronomy, there is a Linux distro dedicated to astronomy. This distro is called "Distro Astro" and can be found at http://www.distroastro.org/. Not all of this software will be in your repositories. If you want some of these programs, then you may need to go to the project's site.